Note: The photo for the "Trick or Treat" has both the "trick" and the "treat" so I thought it would work well for that category since I was trying to think of a non-Halloween related photo. Another note: If any of these photos had me in them, they were taken by my sister - and she had full knowledge that I was entering them in a contest. I'll even share the prize with her if I win! If any of you did the contest too, let me know so I can take a look at your photos! And if you didn't enter the contest, then by all means, head on over to Jessica's blog and vote for me! Yes, I'm campaigning for votes - there was no rule against it. She should have a little voting poll thing open sometime today, so don't forget to vote! This has been one of those weeks where I've been really neglecting the blogging world. It's just been a good week to spend in the real world, so I haven't been on the computer too much. But don't worry, I'm getting back into the swing of things - I'm already planning a few posts for next week. It snowed this week. Alot. It started on Wednesday and snowed until last night - we got over a foot of snow. It was supposed to be bright and sunny today, so I thought it would all be melted by now, but it's not warm today - it's still cold, and the wind is blowing. The snow is really powdery, so it's a little brutal out there. I'm afraid the roads will be worse today than they were earlier this week, which is weird, because it's not snowing today. I have to venture out in the wind to take Harvey to the vet this afternoon. He needs to get the last of his puppy shots. Gracious, he's grown! We've only had him for two weeks, but I think he's almost twice the size he was when we first got him already! It's crazy. I've never taken him to the vet before, so I'm curious to see how he acts. I'll let you all know if he does anything hilarious. Derek is elk hunting this weekend - I hope he gets something! We're going to spend the next couple of nights at my parent's house because their house is closer to Derek's hunting area. It should be fun to hang out with my mom and sister tomorrow while the men are out hunting. I'm planning on getting a few letters written and working on some posts for next week. I need to work on next week's blog posts ahead of time because I'm working everyday next week. I'll most likely be exhausted by the time all is said and done - I wouldn't have volunteered to work those extra days next week if I had realized it would book the whole week. Dental hygiene can be kind of hard on your body, and I've never actually worked five days out of the week before (I know, I'm spoiled). I'll definitely have to watch my posture so I'm not too sore. And that's pretty much my life right now - thought I'd give you all a quick update! I just did something today that I've wanted to do for a long time. This morning I slept in and caught up on my sleep. I woke up, read my Bible, ate breakfast, and took a nice bath. I cleaned the house. Not just straightening up so that it looks passable, I actually cleaned - vaccumed, dusted, cleaned the glass, cleaned the bathroom, scoured the kitchen sink. I had a nice visit with Derek and my mom and sister at lunch. I got some of that pile of laundry done, which felt good. Then I just sat on the couch in the living room with a blanket. I turned off the TV, and there was no music playing. Just sweet silence, sleepy breathing from my three dogs who all decided to take a nap this afternoon, and my new library book. I just started it today, and it's promising to be a good one. Now I'm working on a dinner of chicken and vegetables and this fancy bread, and I'm looking forward to plopping down on the couch and watching the Biggest Loser with Derek tonight, then going to bed early. I got to just really enjoy my time at home today, and enjoy the task of housekeeping and being a wife without a million other things to do on my list. This was one of those days where all the blessings the Lord has given to me are sharply in focus. It's been refreshing, relaxing, and energizing. Sometimes it's just the little things in life that make everything seem better, and the Lord definitely showed me that today. I didn't get a million things done, but I just took the day off and did some of the things that are worth doing, and I feel very happy and satisfied and thankful right now - I think that's worth more than crossing things off my list. Halloween is just around the corner, and usually the holiday brings to mind cute little kids running around the neighborhood in adorable costumes and shyly asking neighbors for candy. Right? Halloween is largely viewed as an innocent holiday for kids these days, an opportunity to dress up and get alot of candy. However, I think everyone would agree that there is a darker side to Halloween. The word also brings to mind images of ghosts and monsters, skeletons and witches. Some people would say that all this is just in good fun - there's nothing wrong with a little scare to get your adrenaline pumping. It's exciting to be frightened every now and then. Right? I think there is one phrase that I associate with Halloween that often gets overlooked. How did Halloween start anyway? I'm not sure the general public is aware of the holiday's origins. Allow me to offer you a brief summary of the ancient history of Halloween. Halloween actually started with the ancient Celts, way back before Christianity had even started to spread across Europe. It was actually called Samhain then, and was the last day of the year in the Celtic calendar. It was believed that on the night of October 31st, the "veil" that separated the spiritual world and the physical world was at it's thinnest. They believed that on October 31st ghosts would roam the earth and wreak havoc on crops and people. In order to avoid being recognized by these ghosts, the Celts would only go outside on the day of Samhain wearing ghoulish masks to disguise themselves, so that the spirits would think the humans were one of them (the beginning of the tradition of costumes on Halloween). The Celts left offerings of food on their doorsteps so that the spirits wouldn't give them trouble (the origin of Trick or Treating, by the way), and carved Jack-o-lanterns to scare the spirits away from their homes. The druid priests created large fires to sacrifice the bones of animals that they didn't believe would survive the winter, which apparently sometimes included human bones (interestingly this is the origin of the word "bonfires" - bone fires). This was a sacrifice to the Celtic gods and goddesses and was meant to keep the evil spirits away. The Celtic priests would also perform divination on that evening, because it was believed that they could see the future more clearly on that day. I decided to do this research on the history of Halloween, because I wanted to explain why Derek and I don't celebrate it. The words that I associate with Halloween in my mind are "spiritual darkness". The origins of the holiday are all about fear, rituals, and divination. The Bible states very clearly that "God has not given us a spirit of fear, but of power and of love and of a sound mind" (2 Timothy 1:7), and that "perfect love casts out fear" (1 John 4:18). We are also told to think about things that are true, noble, right, pure, lovely, admirable, excellent or praiseworthy (Philippians 4:8). Do death, witches, ghosts, monsters, devils, fear and all the associated horrors of Halloween really fit that criteria? I don't think they do. It's true that the holiday is largely celebrated innocently in modern days - but then again, is it really? Every aspect of Halloween that could be deemed "innocent" has it's origins in the pagan beliefs of the ancient Celts. So what are we really celebrating when we dress up our kids in scary costumes and take them out to get candy from strangers? I think we're celebrating paganism. I would also like to point out that this ancient pagan religion is not dead - during my research on the history of Halloween I came across sites and articles written by self-proclaimed paganists which hailed the wonders of the dark side of this holiday. They still celebrate it as the most important holiday of the year, with divination and witchcraft included. One site I found was actually written by an Archdruid priest. As Christians I believe that witchcraft and curses can have no effect on us, because we are protected by Jesus (Genesis 12:3) - but I think we can still sense the presence of evil. Something was not right with some of the sites I visited. I'll leave it at that. Those of you who have read some of my previous informative posts know that I usually include the resources where I found my information. I'm not going to do that today. I actually don't want my blog linking to some of those sites - I don't want that kind of search engine optimization, thank you. I will, however, include an article on John MacArthur's website about Christians and Halloween that I thought was informative and helpful. I give you this information not to scare you or creep you out, but just to get you to thinking about why you may celebrate Halloween, and what you are, in fact, celebrating. I want you to know that I actually had a really hard time writing this post, because I don't want any of you to think I'm judging anyone about this - I just want to inform you of what I know of this holiday and get you thinking about it. I feel like the Lord put this on my heart this year. "Ultimately, Christian participation in Halloween is a matter of conscience before God. Whatever level of Halloween participation you choose, you must honor God by keeping yourself separate from the world and by showing mercy to those who are perishing. Halloween provides the Christian with the opportunity to accomplish both of those things in the gospel of Jesus Christ. It's a message that is holy, set apart from the world; it's a message that is the very mercy of a forgiving God. What better time of the year is there to share such a message than Halloween?" Every Christian has to pray and think about to what extent they are willing to participate in this holiday. Personally, Derek and I have decided not to celebrate any of it's aspects, except to maybe hand out tracts with the candy to any kids that show up at our door. We mostly based that decision on one question that I'll leave you with now. If Jesus lived on earth today, would He celebrate Halloween? 8/2011 - One thing I neglected to address in the original body of this post was "Harvest Parties" or other Christian-based alternatives to Halloween. Personally, I don't have a problem with theses when they are focused on honoring the Lord and telling others about Jesus, and most of them are! Yes, I'm still working on the same book. It just seems like everything is so crazy lately that I don't have much time to read. But I'm probably over two-thirds of the way through it now (it really is a good book, I'm just having trouble finding the time to read). I think I need an easy read for my next book, just to take a break from all this heavy-duty stuff and get back into the swing of things. Suggestions? Thank you, my fellow bookworms! Derek bought this for me the other week at Home Depot. Isn't he cute? I know, I know, it's a little early yet for Christmas. But Derek and I are getting in the spirit early this year (especially since it's been snowing so much), and when we saw all the Christmas stuff at Home Depot we couldn't resist! Derek saw that I liked these, so he bought me one (I'm so blessed to have that man). This Santa stands a couple feet tall, and he only cost fifteen dollars - I thought that was pretty good. Okay, you can all tell me how crazy I am to be thinking about Christmas in October now. I was recently "challenged" by Amy at I Then Shall Live to do a post on my blog about my childhood stuffed animal or blanket. I was definitely a teddy bear girl. My original teddy bear was carried off into the forest by our dog when I was six years old. I was pretty sad for a while, and I couldn't seem to find another stuffed animal that could compare to my first teddy bear. But then one Christmas my parents gave me a new teddy bear - it looked alot like my old one with green "pajamas" and white fur. I actually accidentally saw Teddy before Christmas that year, because I was trying to find something and opened my mom's closet to see this cute little guy peeking out of my stocking - so before I even officially received my teddy bear I loved him! Teddy and I have been through alot together. He got so many holes in him - I always patched him with this red corduroy material, usually around Christmas time for some reason - I guess I always wanted him to look perfect for Christmas. Maybe I subconsciously decided to patch him at Christmas time because that's when I got him in the first place. All of his arms and legs and a significant portion of his body are red corduroy now. I slept with him for many years - I liked having something to hold on to while I slept. The habit of holding him curled up in my right arm is so ingrained in me that to this day when I sleep I tend to curl my right arm like I'm holding something still . . . So tell me about your childhood stuffed animal or blanket. I'm passing the challenge on to all of you - do a post about your childhood friend and post pictures. I told you about mine, let's hear about yours! 1. Carefully sweep the polish over my nails, first the left hand, then the right. Repeat. 2. Sit on the couch and watch TV for ten minutes with my hands in the air. Give them an occasional shake, because we all know that makes the nail polish dry faster, right? 3. Decide that my nails are probably fairly dry by now and I can probably do basic things with my hands, like pick things up with the pads of my thumb and forefinger, being careful not to let anything touch the nail. Proceed this way for another ten minutes. 4. Decide that my nails are probably totally dry by now and do something more daring, like flip open my phone and call someone or open a can of pop. 5. Look down at my nails and realize that I've just peeled the still-slightly-wet polish right off my nail. 6. Sit down with my nail polish and touch up the offended nail. 7. Repeat steps 1-4, and hope Step 5 and Step 6 don't have to be repeated again. I used the Central Park color from NYC first, and like I said, I was skeptical. But alas, after the first two steps, my nails were indeed dry - and they didn't even smear or smudge when I opened my phone! A week later I tried it again with the Broadway color - I actually timed the drying time, and it took precisely five minutes for two coats to dry. Five minutes! I am impressed. I'm pretty much sold. 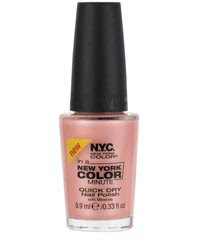 The next time I buy nail polish, I'm going to the New York Color part of the makeup section and buying this stuff again. A nail polish that dries in five minutes and only costs two bucks? Here, take my money! By the way, I also got a "Superior Scribbler" award from Tatiana at Living Life and Loving It! Thanks Tatiana! I think this is a really cute one! Amber at I Once Was Lost, But Now Am Found. Amy at I Then Shall Live. I think you ladies are "Superior Scribblers" too! Though you know I love reading all of your blogs, and if I could give this one to everyone I would - but I guess I just have to pick a few. Bleh. More On Pumpkins . . .
Pumpkins have been on my brain lately - so I thought I'd post another pumpkin recipe! It is that time of year after all. This is a recipe I got from my mother - I've got a wealth of recipes from her. It's about time I start sharing some of them, no? She probably got this recipe from a cookbook somewhere, but we've changed it a little. I wish I could tell you where it originated, but since I can't here's the recipe in it's most recent form. Mix all ingredients in order given. Drop onto a greased cookie sheet. Bake at 375 F for 12 minutes. And get ready for pumpkin yumminess! You can use sugar instead of Splenda if you prefer, but we usually like to eliminate straight sugar wherever possible. I made a batch of these this week and I split up the dough and did raisins in half and white chocolate chips in the other half. I like chocolate in any form, so I had to try the white chocolate chips with these cookies! I think it turned out really good! I also used an overripe banana instead of the half cup applesauce, because I didn't have applesauce but I did have a banana. I do that alot - substitute ingredients in a recipe that I don't have for something that I do have. I think it actually tastes fine - not a bad combination. So I guess I made pumpkin/banana cookies with white chocolate chips or raisins. Ah, but they were good . . .
Derek and I are welcoming a new addition to the family. No, it's not a baby! I had you fooled, didn't I? I think we are crazy, but we are getting another dog! Derek has been wanting a "big dog" for a while (I guess Quincy isn't considered a big dog?). A couple weeks ago a litter of puppies was brought to the animal control for our county. Let all be warned - these are the dangers of having your husband and mother work right next to the animal control office! Derek says he wants me to have a bigger, scary-looking dog around to protect me from any strangers that stop by on my days off. I guess he has a point. I was resistant to the idea at first, but Derek wanted me to stop by and see him. That was my first mistake. Derek and my mom and sister were sitting on the tailgate of my mom's vehicle, and on the ground next to them was the puppy. He was just sitting there very calmly. I told Derek to bring him on over and give him to me before I had to leave for work. That was my second mistake. He just sat there and looked up at me with those sad eyes. He's part foxhound and part something else that we aren't quite sure of, but he's got the personality of a hound. Very mellow, and with big, brown, sad eyes. By the time I got to work I was trying to figure out what we should name him. We went to see him at the shelter a few days later, because apparently it's a law that we can't take him home until he's fixed. He's definitely not the runt of the litter - he was the chubbiest puppy there. I think he'll be a big dog. But when I picked him up he just tucked his little head right under my chin. I melted. We went to visit him again earlier this week and he jumped up and wagged his little tail when we came in. I think he remembered us! We brought Ralphie to meet him, but I think we probably should have waited, because places like that make Ralphie nervous. It'll be good for them to meet again when we bring the puppy home, which will be on Tuesday! I hope the puppy and Ralphie and Quincy get along well together. I'm not too worried, because the puppy is very mellow and seems nice and friendly. I suppose it will take them a little time to get used to each other, but I think they'll be good friends. And now for the name (drumroll please) . . . Harvey! Isn't that cute? Especially when he's this humongous dog walking around the house. I'll leave you with a video. Yes, I've finally figured out a relatively easy way to get personal videos on the blog! You all have never even heard my voice, huh? Well, you'll here a little bit of me talking on here too. Forgive the fuzziness, it's from my digital camera. Harvey One More Time from Callie on Vimeo. Some video footage of our new puppy, Harvey! My blogging friend Jessica at Called to Serve is hosting a photo scavenger hunt this month on her blog! Basically she gives you five categories and you take a picture for each category throughout the month. We submit our photos by November 2nd and then vote on a winner! And there will be a prize . . . I think this is a really fun idea, and I'll be participating. If you'd like to join in on the fun head on over to Jessica's blog and let her know you're in! I'll also be posting my photo submisssions on my blog on November second for your feedback. And if you don't submit your own photos you should at least go over to Jessica's blog and vote for me! He, he . . . Here are the catagories, just to tweek your interest. Yes, I said tweek. It's my own word. Derek and I don't celebrate Halloween because of our personal convictions about it, but I'm thinking of a picture idea for the "Trick or Treat" category that isn't Halloween related. You'll just have to wait and see what I come up with. Today we payed off our last loan, and now we are officially debt-free except for the house. I'm so excited that we were able to get it paid off - it's a good feeling! This time last year Derek had been unemployed for two months, and I was only bringing in just enough to pay the mortgage each month, plus a little bit for tithe (it was really important to us to try to still give ten percent of our income to the Lord, even though it was quite scanty at that point). All of our living expenses and some of the bills were going on the credit card. To go from unemployment to being debt-free (except the house, but I'm not counting that) in one year is just one more sign of how the Lord has been taking care of us since we got married. Last year at this time there was no job in sight and we had two student loans, a car loan, and significant credit card debt (just from living while we had no income). Within the past year the Lord provided us both with jobs, we've been able to pay off the debt we accumulated during our unemployment, we've payed off our other three loans, we were able to take a nice little trip to the east coast this summer (which I never would have thought we could afford last year), and we're doing just fine now. It's amazing how much can change in a year, and it's even more amazing how the Lord has taken care of us through that trial of unemployment. As Derek makes that final payment today, I find myself with a thankful heart! Before today all of our extra income each month was going toward paying off the last of the student loans. So what are we going to do with all that extra money now, you may ask? We're planning on putting a regular amount toward the principal on the mortgage each month, putting some money aside for a car each month (the cars we have now certainly aren't going to last forever, after all), and saving for a nice vacation next year (but I'm not going to tell you where yet, just in case it doesn't work out). God is good, is He not? Whether Derek and I are going through a hard time, or whether we're going through a period of blessings, the Lord has always been there for us to lean on, and He always will be. Because of that, we can face whatever hardships the future might bring - even though everything else may change and everything else may dissappear, Jesus will always be there. And that's a comforting thought. P.S. 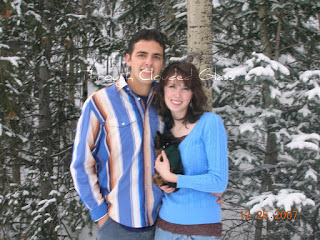 This is an old picture of us, just for kicks. I probably won't get to post again until Tuesday, because our internet chip is broken and we have to get a new one, but to quote Arnold Schwarchernagger, "I'll be back"! If you are of the observant type, you may have noticed that the books in the "Currently Reading" section of the sidebar have been the same for several months. I usually do not have a problem finishing books, but my life is getting crazier by the second! Why, I ask, why! That picture is of me going crazy, in case you were wondering. Well, today is my first day at home in, oh, two or three weeks, and I intend to snuggle down on the couch and read until I fall asleep. Then I'm going to wake up and paint something. Anything, I just feel the need to paint! My intellectual and creative needs have been neglected for far too many days. Just thought you might all be curious about my plans today. Once I finish a couple books and at least get a sketch on my canvas paper, I'll check back in. I actually have alot of interesting stuff to blog about, once I get my sanity back. Earlier this week I went shopping with my mom. I actually did fairly well - I didn't spend too much money! Sometimes I just like shopping too much . . . Ever since I was young I've had a slight dislike of thrift stores. I'm not sure what seems so horrible about them, because alot of times I'll comment on some cute article of clothing or decoration and I'm told it's from a thrift store. You can get some great stuff from them, so they really can't be all bad. But whenever I leave I feel like I need to sanitize my hands. One of the items we were trying to find yesterday was a little baby gate so that we can block off a section of the basement for Ralphie when we're gone. We've been trying to keep him in his kennel, because Quincy does fine in hers, but Ralphie is a really small dog, and he just can't hold it. It's so sad when we get home and he comes out of the kennel all wet - he looks so relieved just to be out! But then we have to give him a bath, and he just looks so lovably pathetic. Ralphie hates baths. My mom is quite a smart shopper, so she thought it might be worth it to check a thrift store to see if they had a baby gate that was inexpensive (those things are not cheap if you buy them new). I walked in there, and I was fine as long as I just looked, but once I picked something up I got that annoying urge to wash my hands again. Honestly, thrift store merchandise can't really be that dirty! Most people probably wash things before they give them to a thrift store (at least we always did). Sometimes I think I have a mild case of OCD. Anyway, we were on our way to another section of the store, browsing as we went, when what do you think I saw? A pair of roller skates! I couldn't believe it, because roller skating has been on my mind since I visited my friend Hazel. I was actually thinking about calling different roller skating rinks to see if any of them were selling their old skates. I think it would be fun to have my own pair so that I could skate around this lake in town if I wanted, or even skate on our cement pad out back (we have this huge cement pad next to our house that will eventually hold a garage). I love skating - it's one form of exercise that I truly find enjoyable. The skates were a size too big, but they were only six bucks! I figured I could stuff a little bit of toilet paper in the toe and they would work wonderfully; and for six bucks you can't go wrong. Do you know how much skates cost brand new? If you can even find skates - they aren't too common anymore. I can't do roller blades because my ankles are too weak - I've never been able to hold my ankles straight when ice skating or roller blading. I really like the stability of the four wheels on roller skates. Well, needless to say, I couldn't pass up an opportunity like that. So I bought the skates. I haven't been able to try them out yet, but I'm pretty excited! Maybe on Friday, since I'm planning on spending the entire day being lazy and having fun. It's been a crazy two weeks. I think I need a skating buddy though - maybe I can convince Derek to skate with me if he gets a pair. Come to think of it, I was so excited by the skates that I don't think we ever ended up looking for a baby gate for Ralphie at the thrift store! Never mind it was the entire reason we went in there in the first place. Oh my. And just in case you were wondering, I did sanitize my hands once we were in the car. Twice. 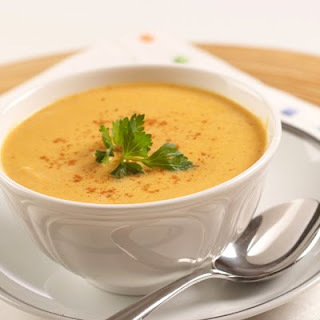 Autumn is here, and I've been waiting all year to make this soup again! This recipe is from VeryBestBaking.com. It is creamy deliciousness, and it just screams "fall". On top of that, it's also really easy to make. I'm going to put all the ingredients in my crockpot today before I leave for work. Then when Derek gets home he can just turn the crockpot on, and by the time I get home the house should be filled with a scrumptious aroma! I actually don't even do the last step with the blender, and it turns out just fine. Enjoy and have a great Wednesday! Our Trip To Hazel's; Warning: Lots of Pictures! This past weekend my sister and I went to visit some dear friends of ours at their ranch on the eastern side of our state. We had alot of fun! I met Hazel when I was nine years old - we had just started going to a new church, and I remember the first time I saw Hazel she was standing by the merry-go-round outside the church in a long beautiful furry black coat. She stood there grinning at me, and before we knew it we were fast friends! We've remained friends even though Hazel and her family moved away a few years after I met them, and we still have all kinds of fun times together when Hazel and her sister come to visit Rae and me, or visa versa. Good life-long friends are hard to come by, so I know the Lord truly blessed me when I met Hazel! This is the first time we've been able to go out and see them at their ranch since I got married, and we did all kinds of fun things while we were there. Here are some pictures (by the way, let me know what you think of the new camera). This is Hazel and Heather's house. Hazel and her family are building a missionary house on their property for missionaries to stay in when they're on furlough. The basement is lovely for roller skating (Hazel and I are big fans of roller skating). Hazel's family got this cute little Easter bunny figurine set at an auction, and Hazel, Heather, Rae and I all sat down and painted it. It took a long time, but it turned out rather well, if I do say so myself. This is Hazel and me, and that's the missionary house in the background. On Friday night we had a picnic supper in the basement of the missionary house. It was delicious! Hazel and Heather also had a tent set up in the basement of the missionary house, and that's where we slept. I thought it would be terribly cold, because it was a pretty chilly day, but the four of us were pretty snug in that tent. I didn't get cold at all! Hazel gave us a sneak preview of her new book while we were there. Hazel already has a book published, and she's hoping to publish this one when she's done. She might let me proof-read it! Hazel's older sister, Holly, took us on a ride in their chuckwagon, pulled by their oxen. It was alot of fun! And that's their dog, Jill. This is the lovely panoramic picture I took on our ride. I think it turned out pretty neat! Though you can kind of see where the pictures were stitched together, but that's okay. It's really cool, because the camera has you take three pictures and it lines them up automatically! I'm really impressed with it. Unfortunately it is rather small when I try to put it on the blog, but you get the idea. This is a picture of us writing short scary stories and reading them to each other! Except by "scary" we mean tense and suspenseful. We don't do horror. Whew, that was alot of pictures - more than I thought I had. We had a really wonderful trip out there, and we got to do alot together in the twenty-four hours we were there! Thanks for your hospitality Hazel and Heather! We had a ton of fun visiting with you guys! 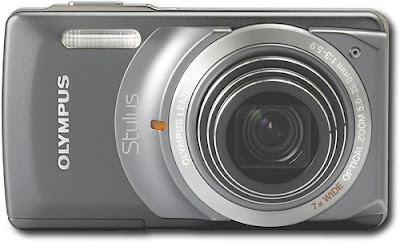 So what do you all think of my camera? I'm not sure I can tell if there is a difference or not. Do you think the pictures are any clearer? Categories: Family, Photos, Vacations and Trips, What Do You Think? Last Thursday a catastrophe happened! My camera was dropped - the camera we've had for over a year, the camera that my grandparents gave us for wedding gift. At first it seemed like it was fine, and it even took another picture that turned out great. But when I turned it off and tried to turn it back on, the lens wouldn't come out all the way. I tried everything I could think of to get it to work properly, but I think the lens was jammed when we dropped it. I think I had a warranty on it, but it was probably only for one year, and regardless of how long the warranty covered the camera, I can't find the paperwork anywhere. It would probably cost more to fix the old camera than to just buy a new one, so that's what I did. 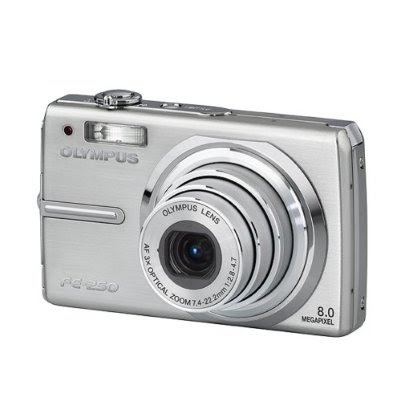 My old camera was a really nice Olympus, so I decided to stay with the Olympus brand because it had served me well so far, and I still have an Olympus battery and a memory card, so I was hoping to use those for the new camera as well and save some money. Derek told me to pay a little more for a nicer camera if I had to get a new one (he's such a thoughtful husband), so I got this little beauty. I payed two hundred dollars for it. It's 12 megapixels (my old one was 8 - I'm really excited to see if the extra megapixels translate to clearer pictures when I post them on here - you all will have to let me know), and it has two settings that I'm dying to play with. One is a beauty setting - it basically detects your face and smooths out any imperfections. The other is a panoramic setting. That's right, panoramic pictures! I'm so excited! This past weekend my sister and I went to visit some friends and I got to try it out - get ready for some pictures of our trip, taken with the new camera, coming up soon! Earlier this week I had a flood of requests for pictures of the dress I got for Derek's cousin's wedding (okay, okay, it was technically only two requests for pictures, but to me that's a flood)! So my wonderful mom took some pictures for me. Here they are; these pictures were taken on my parent's property - it's finally starting to look like fall here (as opposed to summer or winter). Please ignore my painfully white legs - I just threw the dress on for pictures, no time for nylons. Of course I'll be wearing nylons and black pumps with it at the wedding. I got this dress for ten dollars on clearance at TJ Max. I love the clearance sections at those already-cheaper-than-normal stores! The belt I got at The Icing for twelve dollars - not that great of a deal, but the total price of the outfit isn't bad. I thought I'd also throw in a couple pictures of my new winter coat. Remember how I was telling you that I needed a winter coat, since it's snowing here already? Well, I thought I'd have to pay at least a hundred for a nice peacoat. Bet you'll never guess how much I got this coat for. Forty dollars! I love Ross. I knew I either wanted a winter coat that was an interesting color (like red or blue) or had an interesting detail. Black is a pretty basic color, but what I like about this coat is the over-sized lapels - that makes it interesting to me! I like to pick clothes that have some interesting feature about them if I can, so I was very happy with this find. And I could hardly pass it up for forty dollars, even if it isn't red or blue! So what do you think of my purchases? How do you like the dress for an evening wedding in October? Categories: Fashion, Weddings Etc., What Do You Think?